Seminar Series on Earth System Sci. Presentations in this series by visitors and GMAO scientists address a broad range of topics in Earth System Science. The series is organized by Manuela Girotto, Dan Holdaway, and Emma Knowland. Unless otherwise noted, seminars take place at 10 a.m. in GSFC Building 33, Room H114, on two Tuesdays each month, with extended breaks for the summer and winter vacation and conference seasons. Ensemble-based data assimilation systems typically use background error covariance localization to dampen spurious correlations associated with sampling error while increasing the rank of the covariance estimate. Variational methods use model-space localization, in which localization is applied to ensemble estimates of covariances between model variables and is based on distances between those variables, while ensemble filters apply observation-space localization to estimates of model-observation covariances, based on distances between model variables and observations. It has been shown that for non-local observations, such as satellite radiances, model-space localization can be superior. In this talk we will present a method for performing model-space localization in serial ensemble filters using the linearized observation operators. Results of radiance-only assimilation in a global forecast system show the benefit of using model-space localization relative to observation-space localization. The serial ensemble square root filter with vertical model-space localization gives results similar to those of the EnVar system (without outer loops or extra balance constraints), and to ensemble Kalman filter using modulated ensembles to emulate model-space covariance localization. See GMAO Seminars Series archive. The GMAO Research Theme Meetings are open only to GMAO members. These internal meetings, provide an opportunity for GMAO researchers to present new research results to their colleagues and to discuss their work and its implications for GEOS systems. Each year, two seasons of meetings are held on roughly two Thursdays each month. 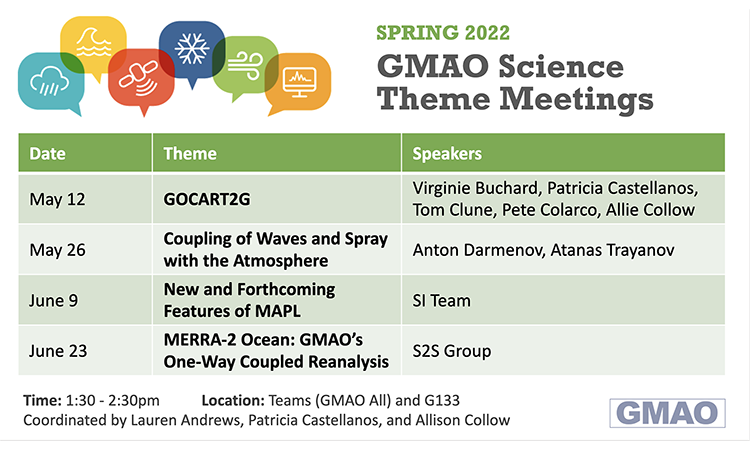 ♦ See the latest GMAO Research Theme Meeting schedule.